Are you making a car part or a novelty item? Car part = ABS, novelty item = PLA. I print a dash latch to suit Ford Territory cars that I have sold over a thousand of (bingtastic.com), and I only use ABS Filament. But ABS isn’t always the best choice. If you are making prototypes or 3D printing a Yasuo figurine from League of Legends for yourself or as a present for a friend, PLA is the way to go. ABS is an industrial plastic found in everything from car bumpers to computers to air conditioners, etc. You probably have a ton of it in your home. When 3D printed it remains fairly solid and has the characteristic lines for each layer. It is harder to print with, and is very fussy about temperatures and any slight breezes – especially when doing larger builds. PLA is cornstarch. It is a specialised material designed for 3D printing, and makes it easy to 3D print things. PLA melts as it is placed, so each layer is less distinct and flows more into the previous layers. If you see a demo part printed to show off a 3D printer, you can just about guarantee it is printed in PLA. Melts more as it is printed, so finish is smoother. 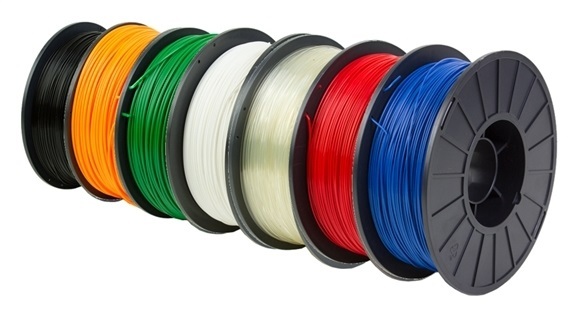 And then there are a ton of other filaments like nylon, and ones with other bits in them like wood (has sawdust in it and creates a nice wood like finish), and metal look (has metal powder that gives a metal look, but not metal strength).